ALEXANDER "ELIC" SCOTT s/o John Wilson & Nancy Keith Scott b. late 1789 maybe Washington co. Va. (he said in both censuses, 1850 and 1860, that he was born in Virginia, and there is some evidence that his father lived in Washington county around 1789) d. 1866 Daviess co. Mo. m. ca. 1814 Rebecca Blackburn (possibly Hall) b. 1792 (3 Dec 1796?) Virginia? d. 3 Jan 1837 ("aged 44 years") McLean (now Dewitt) co. Ill. Rebecca's tombstone was said to have been found in a trash pile at the side of Rock Creek cemetery near Waynesville, Illinois. I have seen the tombstone myself, and the date of death on it is unquestionable. Their last child is said in many records to have been born in 1840, putting Rebecca's death date into question- however, that child (Elizabeth)'s age in census reports conflicts with that birthdate. Some records show Rebecca's tombstone to say "aged 44 years 1 mo. "- this is NOT true, at least as far as I can tell. After their marriage (their marriage record has not been found), they seem to have lived in Lee co. Va., because their eldest child's biography said he was born there. However, I searched the county's records extensively, and have found no record of Alexander ever living there. The death certificate of James K. Scott, son of Dr. Alexander K. Scott (below), makes a point of stating that Alexander K. was born in Greenbrier county, (present-day West) Virginia. 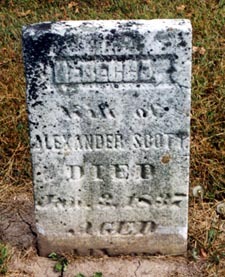 A granddaugher's biography stated they moved from Virginia directly to Bloomington, Illinois when John B. Scott (their eldest) was a small boy (he was about 15 when we know they were in Ill.), but Alexander K. Scott's (below) biography states that they moved to Jackson co. Tenn. in 1818, and then to Illinois in 1826 (in fact they were in Macon county Illinois in 1830), to rejoin the rest of the family. However, I have yet to find them in the 1820 census- they are not in Jackson co. Tenn. I'm becoming more and more suspicious about Rebecca's maiden name. There is simply no Blackburn family anywhere missing a daughter or living near the Scotts at any point. It's clear certain names Alexander and Rebecca gave their children- Jane, Ira G., Prudence, and maybe Elizabeth- were not used in the Scott family, and would follow that they were names of Rebecca's relatives. Unfortunately, my suspicion is that the name Blackburn- listed as daughter Ruth's middle name- was simply applied as her mother's maiden name. I have yet to see original proof that it was Rebecca's maiden name. Also, on Ruth's death certificate, her mother's name is clearly listed as "Rebecca Hall". Their eldest son, John B., seems to have the middle name "Benoni". That is the original name of the Benjamin of the book of Genesis; it is typically (though not always) used as a middle name for a child born out of some kind of tragedy, like the death of the mother. Could it be that John B. had a mother that died in childbirth, and then Alexander Scott married Rebecca Blackburn? Andrew Jackson Scott, born in 1836, may in fact have been a son of John B. Scott, as some of John B. Scott's descendants believed, but I have yet to find proof of his parentage. The information came originally from a descendant who was wrong about other things in her letter. 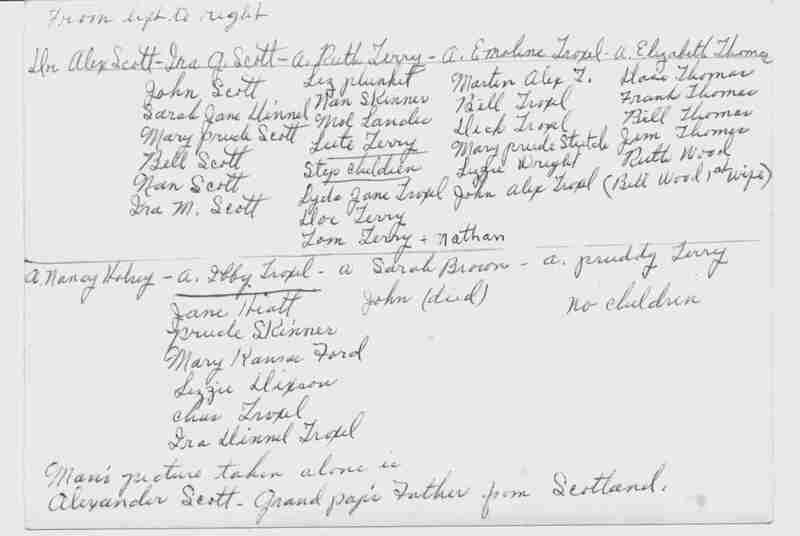 Either way, he was raised by Alexander Scott, but John B. Scott's other known son born before 1840 - William M. Scott was raised by others as well. Andrew not actually being the son of Alexander may also account for why he is not in the below photograph. Jesse F. Scott (or Jesse Y.) was actually Jesse French (below) who was adopted by Ira Scott. 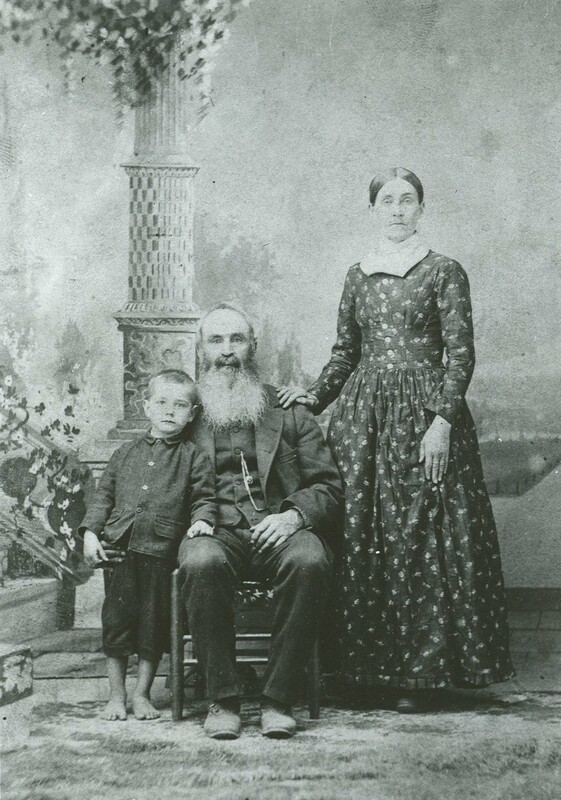 There is a record floating around the IGI in the LDS database (with no source) that says Jesse Y. Scott was the son of Alexander and Rebecca Hall Scott, and was born 1840 and lived in Dewitt county Illinois; Alexander and Rebecca were married ca. 1814/15; and Rebecca was born 3 Dec 1796 in Virginia. I'm trying to track down the source of that information. On the back of this photo, along with the names of the people on it, it says "Man's picture taken alone is Alexander Scott- Grandpap's Father from Scotland". I take this to mean that there existed a photo of Alexander Scott at some time. The children in this family show a remarkable tendency to give wildly varying ages on census returns. L-R Back: Dr. Alexander K. Scott, Ira G. Scott, Ruth Blackburn Scott Terry, Rebecca Emaline Scott Troxel, Elizabeth Scott McCoy Thomas. L-R Front: Nancy E. Scott Halsey, Jane Isabell Scott Troxel, Sarah Scott Brown, Prudence Scott Terry. Missing from photo: John B. Scott (deceased), Andrew Jackson Scott (deceased), Mary C. (if there was one), and the daughter who died young. If in fact they were deceased, and this is why they're not this photo, then this picture would have been taken between 1881 and 1895. John Benoni b. ca. 1815 Virginia d. 8 Apr 1873 LeRoy, Coffey co. Kansas (which he co-founded) m/1. ca. 1835 Rena Halsey, who d. ca. 1836 (one child, William M., who was raised by his maternal grandparents and then Dr. A. K. Scott from 1847); m/2. 24 Aug 1837 Fulton co. Ill. Anna Davis b. 1810's Columbia, New York d. ca. 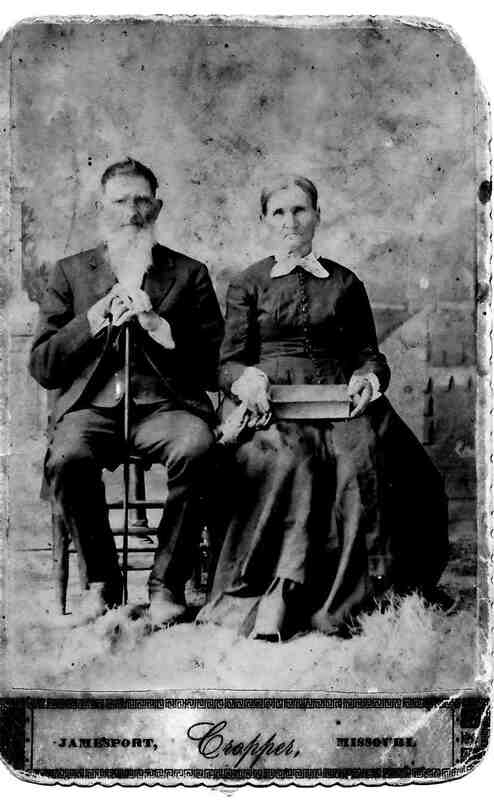 1842 Iowa (2 children- they are listed living in Dewitt county Illinois in 1840, with a boy and girl under 5; John also voted in Dewitt county in 1839); m/3. 2 Nov 1843 Fulton co. Ill. Lucinda Adams Davis b. 1824/5 New York d. 1880 LeRoy, Coffey co. Kansas (5 known children). Anna and Lucinda Davis were sisters. About 1841, John moved to Fort Des Moines, Iowa Territory, where he raised farm products for a garrison of Dragoons, traded with the Sac and Fox indians, and ran a ferry business. When the indians were relocated to Kansas in 1849, John moved with them- they owed him $20,000. He left the reservation in 1854 and formed the town of Le Roy, Kansas, with his brother-in-law Frederick Troxel. He kept the first post office there, and was the first Justice of the Peace in Coffey county, commissioned in 1855. He was authorized in 1860 by the Kansas state legislature to, with two others, keep a ferry running over the Neosho river in Coffey county. He was known as "General" John B. Scott because he was appointed Major General of the Kansas Home Guards. General Scott commanded the troops of the Neosho Valley Home Guard contingent of the 9th Kansas Cavalry, during the Civil War. He and his command were garrisoned at Fort Scott during this conflict. The First and Second All Indian Home Guard Units were attached to his command. His son-in-law Alexander Hamilton perpetrated one of the most famous UFO hoaxes in history- the original "cow mutilation" story. His great-great grandson is former governor of Kansas Bill Graves. Alexander Keith (M. D.) b. 25 Feb 1817 Lee county, Virginia? (his son James' death certificate makes a point of stating A. K. Scott was born in "GreenBrier County W Virginia") d. 31 Jul 1902 Daviess co. Mo. m/1. 14 Nov 1838 McLean co. Ill. Louisa Troxel b. 4 Nov 1820 Grayson co. Ky. d. 4 Jan 1884 Daviess co. Mo., 11 children; m/2. 21 Mar 1885 Daviess co. Mo. Mary E. Dixon/Dixson d/o Lemley & Sarepta DeLay Dixson b. 21 Nov 1854 Jameson, Daviess co. Mo. d. 4 Oct 1927 Jamesport, Daviess co. Mo. ; 3 children who all died as young adults (could that be connected to their father's age?). A. K. Scott moved to Coffey co. Kansas in 1855, then to Daviess co. Mo. a year later. He was said to have become a doctor after a spate of bad health in about 1841. Nancy E. b. 20 May 1819 Tennessee? (she listed Tenn. as her birthplace in an 'old settlers' register, but listed her birthdate as 20 Apr 1820; in the 1900 census, when she was 80, she said her birthplace was Virginia, and her birthdate as April 1820) d. 1900-10, maybe in Amboy, Illinois (her son George W. Halsey lived in Viola township, Lee co. Illinois in 1910; I believe that's why someone thought she died in Lee county) m. 11 Jan 1838 Eli Halsey b. 15 Apr 1815 Grayson co. Va. d. 20 Jan 1892 Dewitt co. Ill. 15 children. Nancy is listed as "Nancy Malsey Scott" in one record. Mary C.? b. ca. 1822 (6 Aug 1818?) (d. 4 Mar 1846?) 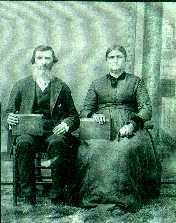 m. 20 Oct 1843 Dewitt co. Ill. Henry Barns (3rd marriage of 4) b. 1808 d. 1876; one child. I have no proof this marriage is to a daughter of Alexander & Rebecca, but there was another daughter about this age that left the household in the 1840's, and as far as I can tell, all the Scotts who lived in Dewitt county in 1843 were part of our family (and by 1850, there was only one unrelated Scott family in the county - who were far too young to have Mary as their daughter). The dates above are from Mary C. Scott Barnes' headstone (Dewitt Cemetery, Farmer City, Dewitt co. Ill.), whoever she was. Jane Isabelle b. 19 Dec 1822 Va. or Tenn. d. 14 Oct 1895 Daviess co. Mo. m. 24 Jun 1842 Dewitt co. Ill. Frederick Storms Troxel b. 20 Jan 1816 Grayson co. Ky. d. 18 Jan 1892 Daviess co. Mo. Ira G. b. 9 Feb 1825 Jackson co. Tenn.? d. 8 Nov 1906 Daviess co. Mo. m. 22 Nov 1847 Dewitt co. Ill. Mary (Polly) Chatham b. 24 Nov 1824 Indiana d. 8 Feb 1915 Daviess co. Mo. In addition to their children, living with them in the 1850 census was a Jesse F., age 10. He was actually Jesse French, who was adopted by Ira & Polly when his parents were killed in a wagon accident. Prudence b. 14 Feb 1827 Macon co. Ill.? d. 22 May 1918 Daviess co. Mo. m. 24 Oct 1859 Enos (Enoch) A. Terry b. 10 Aug 1819 Hamilton co. Ohio d. 23 Oct 1897 Daviess co. Mo. Although there should be, there is no death certificate filed for Prudence. Ruth Blackburn b. 16 May 1831 Macon co. Ill.? d. 1 Dec 1920 Daviess co. Mo. m. 13 Oct 1859 David Nelson Terry b. 21 Oct 1825 Franklin co. Ind. d. 25 Jun 1908 Daviess co. Mo. 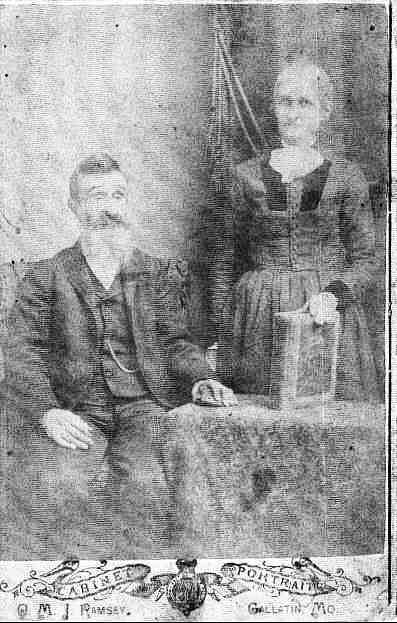 They were Arta Blonshine's great-grandparents. Her mother's name on her death certificate is listed as "Rebecca Hall". Rebecca Emaline b. 8 Jun 1835 Ill. d. 10 Jul 1901 Daviess co. Mo. m. 23 Oct 1849 Daniel L. Troxel b. 7 Dec 1829 d. 18 Jan 1906 Daviess co. Mo. Andrew Jackson b. 1836 Ill. d. 9 Sept 1881 Grand River twp., Daviess co. Mo. m. 9 Sept 1857 Mary Ann Brown b. 1836 Ill. or Nov. 1834 Missouri d. 1919, buried Old Scotland Cemetery, Daviess co. Mo. 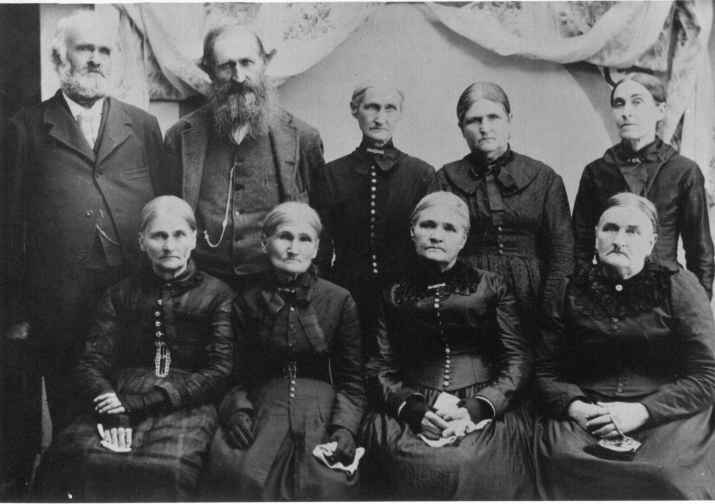 (no Missouri death certificate); 10 children, 6 living in 1900. The one time Andrew was asked on a census report where his mother was born, he said Illinois, which no one else ever said of Rebecca Blackburn/Hall.. As stated above, may have been the son of John B. Scott, not his brother. Elizabeth H. b. 25 Jun 1835/1840 Ill. d. 9 Jan 1913 Daviess co. Mo. m/1. 6 Jul 1861 Rolland McCoy d. 22 Aug 1862 Daviess co. Mo. m/2. 29 Mar 1870 Isaac Newton Thomas b. 10 Jun 1831 Ripley co. Ind. d. 17 Jun 1910 Daviess co. Mo. Elizabeth's listed birthdate is clearly wrong on her headstone (1840), because it's after her mother's death date, but the date on her death certificate (1835) doesn't work either, if we accept Rebecca's birthdate. Her mother's name on her death certificate is listed as "Don't Know"